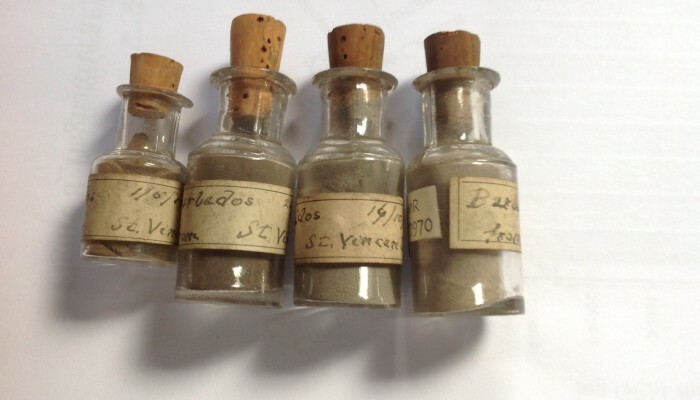 Volcanic ash samples collected on Barbados, deposited after eruptions of St Vincent in 1812 (small vial) and 1902. British Geological Survey Archives. On May 1st, 1812, a remarkable weather system reached Barbados. ‘At half-past twelve AM a heavy dark cloud obscured the heavens completely. [..] at half past one a sandy grit began to fall in small quantities‘. Through the night there was the sound of explosions and thunder, and by late afternoon, Barbados had been blanketed in several centimetres depth of ash. The origin of the ‘May dust’, as it came to be known, was soon found to be due to a violent eruption of the Soufriere volcano, on the nearby island of St Vincent. The German explorer and botanist Robert Schomburgk later realised that this ‘rain of ashes’ showed that there must be winds in the upper reaches of the atmosphere in the Caribbean that blow in the opposite direction to the Trade Winds, near the surface. When he was living in Barbados, in 1846, Schomburgk could still find patches of the May dust across the island, which he collected and shared with Christian Ehrenberg – a scientist who had recently discovered traces of aquatic organisms in wind-blown Atlantic dusts. Later work on archived samples of this May dust showed that they were rich in bacteria and fungal spores, perhaps carried in place by high-level winds. Barbados, it turns out, is no stranger to dust. Mostly, this is carried in from Africa, and is usually only detected by careful air-sampling using carefully cleaned filters. 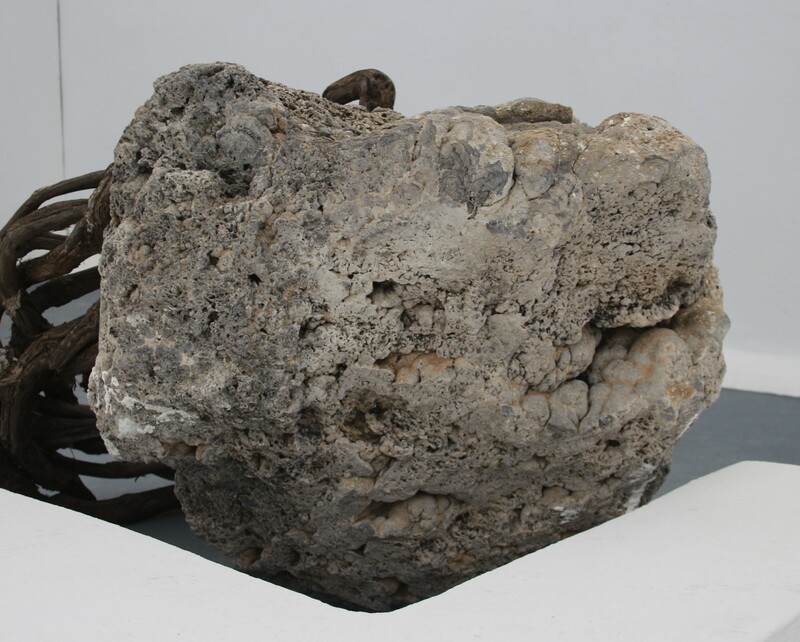 But, as we saw in 1812; and then again in 1902, 1903 and 1979, everytime there is an explosive eruption of the Soufriere of St Vincent, Barbados is coated in another layer of mineral dust and volcanic glass. Two hundred years on, and we are still learning how the interaction of the atmospheric winds with the topography of the planetary surface controls where ash is carried, and then dropped, from erupting volcanic plumes. In a new paper, we use sensitive models of the wind-field, that account for the reversal of wind directions and the fine-scale topography of the islands of St Vincent and Barbados, to simulate ash fallout after the 1902 and 1979 eruptions. The computer simulations show how these two factors influence the distribution of ash after an eruption, but also that we can reproduce the observations made on the ground in 1902, and 1979. This approach means that we now have a way to improve forecasts of where volcanic ash will go, and when and how much will land on the ground during an eruption. Given how sensitive human lifelines – transport, water, food and power supplies – are to disruption by volcanic ash, this could be an important step forwards. Darwin, C (1846) An account of the fine dust which often falls on vessels in the Atlantic Ocean, Quarterly Journal of the Geological Society, London, 2, 26-30. Delaney, AC et al (1967) Airborne dust collected at Barbados, Geochimica et Cosmochimica Acta, 31, 885-909. Poulidis, AP et al (2018) Meteorological controls on local and regional volcanic ash dispersal. Scientific Reports, 8, 6873. Pyle, DM et al (2018) The 1902-3 eruptions of the Soufriere, St Vincent: impacts, relief and response. Journal of Volcanology and Geothermal Research. Schomburgk, RH (1848) The History of Barbados. Longman, Brown, Green and Longmans, London. pp. 69-72. Wilson, T (2012) Volcanic ash impacts on critical infrastructure, Physics and Chemistry of the Earth A/B/C, 45-46, 5-23. This work was inspired by the STREVA project, funded by the UK Natural Environment Research Council (NERC), and is the product of a collaboration between scientists based in the UK, Caribbean, Japan and Singapore. Guntur volcano, Java. Original lithograph by Franz Wilhelm Junghuhn, and published in Johannes Muller's Beschreibung der Insel Java (1860). Oxford, Bodleian Library (OC) 246 h.70 opp. p. 109. 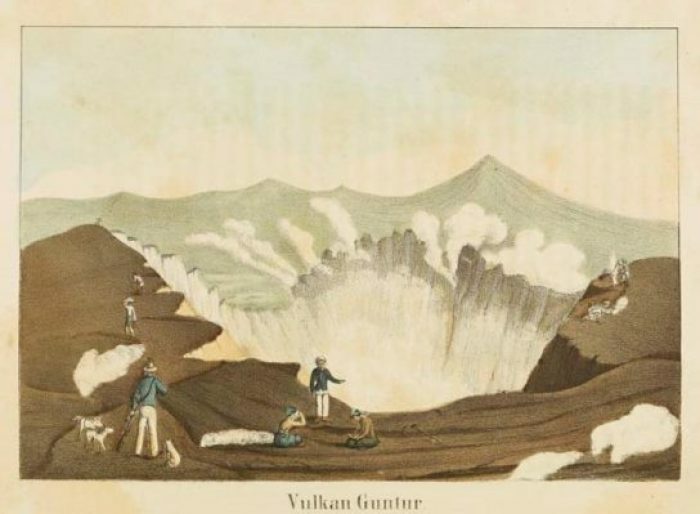 Guntur volcano - meaning 'thunder' in Javanese; 'torrent or flood' in Sundanese - was one of the most active volcanoes in Java in the early 19th century. During the eruption of October 1800, lahars inundated several villages near Guntur. Since late September, the eyes of the volcano world have turned to Gunung Agung. This prominent volcano in Bali last erupted in 1963, when it released enough sulphur dioxide to form a global stratospheric sulphate aerosol layer that led to vivid sunsets, and short-term global cooling. The 1963 eruption was one of the largest and deadliest in Indonesia in the 20th century; and many of the casualties were caught up in the violent pyroclastic flows and mudflows, or lahars, that swept down the flanks of the volcano in March and May 1963. Even though the eruptive activity at Agung is currently at a low level, the immediate hazard is once again due to the lahars – slurries of ash and water, that may form during heavy rain, and run rapidly down the volcanic flanks. Lahars have already featured prominently in English language news reports; with some described as ‘cold lava‘. Cold lava, it turns out, is the ‘Google translate’ rendering of the phrase lahar dingin, from some reports of the activity. The problem is not one of Google’s making – but goes back to the way the word ended up in English usage. Lahar is one of the few words from Javanese that has entered the English language. The Oxford English Dictionary entry for lahar describes it as a ‘destructive mudflow on the slopes of a volcano’; originating in the 1920’s. A contemporary Indonesian – English dictionary offers two translations for the Indonesian word lahar – 1, lava; 2 mudflow. Older dictionaries have only the first rendering of lahar, meaning lava. Although this isn’t reflected in English dictionaries, lahar was a geographical term familiar to Dutch colonialists in Java by the mid-19th Century. The botanist and geologist Franz Junghuhn used the term lahar to describe the ravines on the slopes of Kelud, Java (Junghuhn, 1854). In reports of the January 1864 eruption of Kelud, Colonel Versteeg, of the engineering corps of the Dutch colonial army, describes how his workmen shouted “lahar is coming“, shortly before a hot stream of ash and water swept by (Versteeg, 1864). John Hageman experienced the same eruption ‘We heard a thunderous roar approaching .. and a moment later the sizzling fluid rolled by‘. At Kelud, these destructive flows formed when the eruption emptied the summit crater lake ‘in a single shock; and the water mixed with sand and stones flowed .. to the south-west and north-west along the so-called Lahars or ravines.‘ So, while lahar is only ever used in English as a technical term to describe a particular sort of flow; its non-technical meaning in Indonesian is clearly rather broader. The use of lahar to mean a ‘flow of volcaniclastic debris and water’ first came into use in volcanology in the early 1920’s, following another eruption of Kelud in 1919. This eruption caused a terrible loss of life as the crater lake failed, sending cascades of lahars down the ravines that drained the flanks of the volcano. These flows and their deposits were described by the geologist Georg Kemmerling in 1921. Kemmerling distinguished hot (eruptive) and cold (non eruptive) lahars; and recognised that their deposits were dominated by sand-sized material, rather than mud. The next year Berend Escher (brother of the artist, M C Escher) compared the lahars of Kelud to the newly-described deposits of the Valley of Ten Thousand Smokes, emplaced during the 1912 eruption of Novarupta (Alaska). British Geologist John Brooke Scrivenor wrote a short account of the Kelud lahars in 1929; and the term later gained widespread use in volcanology after the 1940’s. Globally, lahars are one of the most significant hazards posed by volcanoes, due to their capacity to rapidly inundate areas many tens of kilometres from the erupting volcano; while the threat from lahars may continue long after an eruption has ceased. We can only hope that the preventative measures taken around Agung are sufficient to reduce the threats from lahars to those living nearby. Escher, BG, 1922, On the hot ‘lahar’ (mud flow) of the Valley of Ten Thousand Smokes, Alaska, Koninklijke Nederlandse Akademie van Wetenschappen, 24, 282-293. Hageman, J, 1865, Bijdragen tot de kennis der uitbarsting van den Keloed op 3 Januarij 1864, Natuurkundig tijdschrift voor Nederlandsch Indië, 28, 475. [in Dutch]. Kemmerling, GLL, 1921, De uitbarsting van den G. Keloet in den nacht van den 19den op den 20sten Mei 1919: Dienst van het Mijnwezen in Nederlandsch Oost Indie, Vulkanol, Mededeel., 2, 120 p. [in Dutch]. Rigg, J, 1862, A dictionary of the Sunda language of Java, Verhandelingen van het Bataviaasch Genootschap van Kunsten en Wetenschappen, Deel XXIX. Versteeg, WF, 1864, Vervolg op de Aanteekeningen omtrent aardbevingen in den indischen archipel, 27, 129. [in Dutch]. The flooded caldera of Santorini volcano holds many secrets, buried beneath the ash and pumice of its last great eruption. In the Late Bronze Age, about 3600 years ago, an explosive eruption several times larger that of Krakatoa, 1883, wreaked devastation across this thriving island. View, looking North, of the northern part of the Santorini caldera. The island of Therasia (left) is separated from the island of Thera (right) by a channel, that is now thought to have formed at the end of the Late Bronze Age eruption. 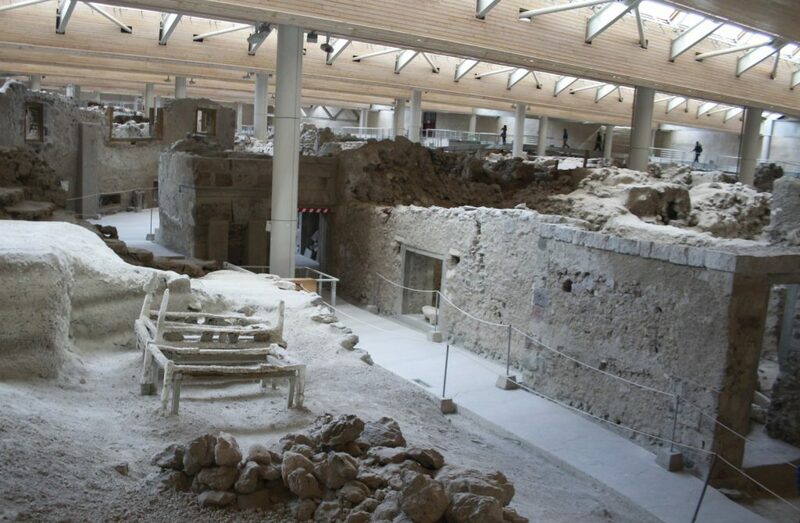 A great trading port, Akrotiri, was buried under metres of pumice; preserving for future generations a snapshot of Late Cycladic urban life. Bronze Age street scene – Akrotiri, Santorini. Precursory earthquakes damaged the town. But there was time for the residents to clear up rubble (foreground), and rescue furniture (those are casts of bed frames in the street), before the town was buried in pumice. 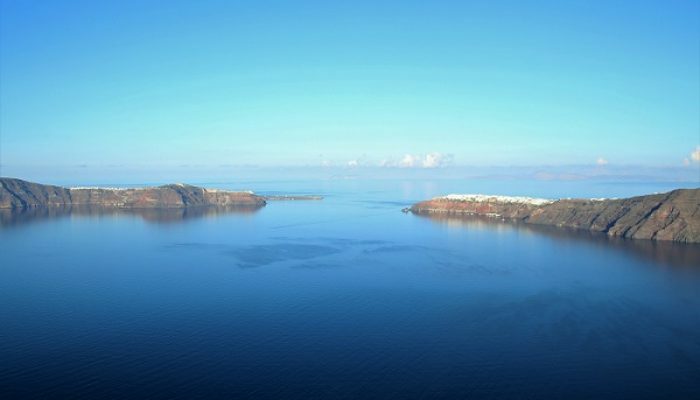 Once the eruption was over and the dust had, literally, settled the geography of Santorini would have looked much like it is today: a group of three islands, forming a ring around a caldera occupied by the sea. The central ‘Kameni’ islands would not have begun to emerge for another thousand years, or more. But when did the sea flood the caldera, and what were the consequences? It has long been suspected that the Santorini eruption triggered tsunamis, implicated in Late Bronze Age destruction along exposed coastlines around the Aegean. 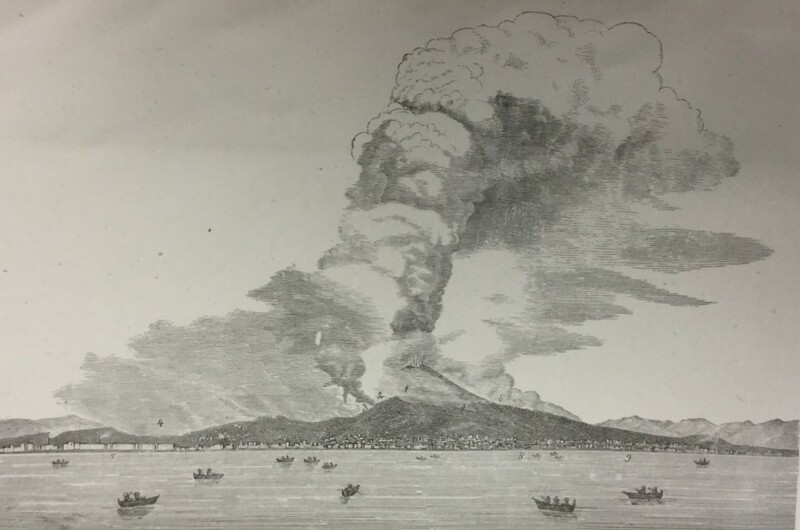 Observations of the Krakatoa eruption in August 1883 include harrowing accounts of the great sea waves that swept across low-lying areas of Java, Sumatra as this eruption reached a climax. These tsunami were triggered either by the convulsions of the sea-floor, as the island of Rakata collapsed into the newly-forming caldera; or, as now seems more likely, by the displacements of colossal volumes of water as the pyroclastic currents raced into the sea. 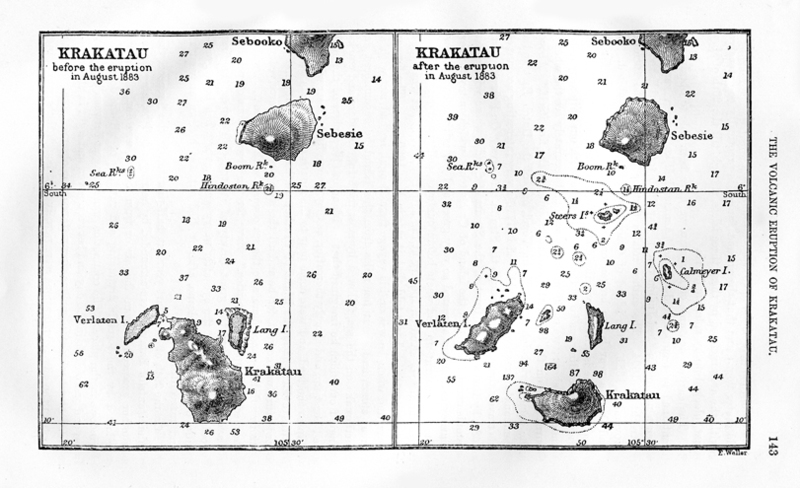 Krakatoa – before and after: notice how much of the island of Rakata (labelled Krakatau) has disappeared in the eruption; and the large shoals of pumice that formed new islands north-west of Krakatau (Proceedings of the Royal Geographical Society). But could tsunami have been triggered by the Santorini eruption; and how? Until now it has been thought that collapse of the caldera could have triggered a tsunami; but only if the caldera was already flooded by the sea. 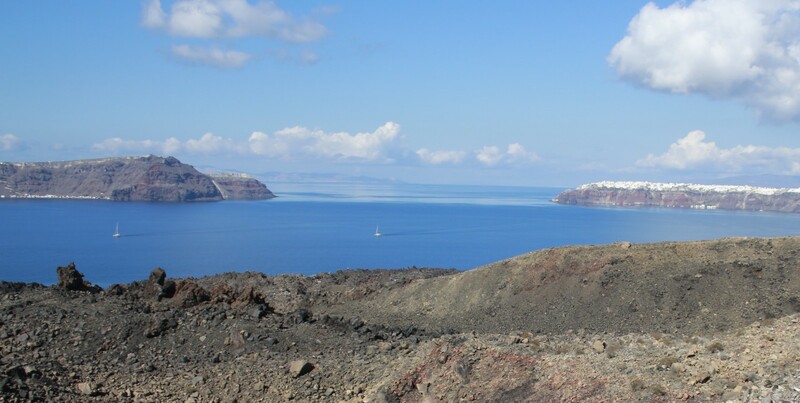 A growing body of geological and archaeological evidence suggests that the crater of Santorini volcano was not open to the sea, as it is today, at least at the beginning of the Late Bronze Age eruption. Large blocks of stromatolites, an algal concretion, and chicken-wire gypsum that were caught up in the eruption debris point to the presence of a muddy lake in the northern part of Santorini. Before the eruption, this would probably have been an area of hot, bubbling mud-pools, fed by volcanic heat and fluids from depth. Among the wall-paintings from Akrotiri is one, the flotilla fresco, that shows a city on a hill, with a river running by. Are these features that might have been found inside the caldera of the volcano? Metre-wide block of stromatolite, thrown out during the LBA eruption, now in the entrance to the Heliotopos hotel. In a new paper in Nature Communications, we present some new evidence that may help to resolve some of these questions. 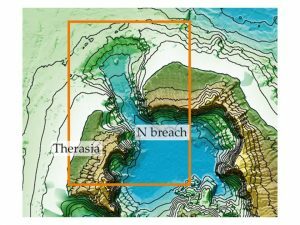 High-resolution mapping of the seafloor shows the presence of a remarkable scour at the northern end of the deep channel that separates the islands of Therasia and Thera, below the town of Oia. This feature can be seen on older sea-floor maps; but not in such detail. Using sound-waves to look at the structures that this channel cuts through shows that the channel didn’t form until most of the material thrown out in the eruption had already been deposited. The shape of the scour will be familiar to anyone who has built dams of sand on a wet beach, and then let it fail. This shape shows that the channel formed quickly, and that the sea broke through and poured down a great waterfall into the caldera, but only after the eruption was over. Any tsunami waves that formed during the eruption must have been triggered by the entry of the pyroclastic currents into the sea. Image of the northern ‘breach’ in the Santorini caldera, and the scour and channel that cut through it. From Nomikou et al., 2016. This new evidence, along with new ‘cosmic ray exposure’ age measurements showing that the cliffs of the northern part of Santorini are ancient and formed before the Late Bronze Age, may strengthen arguments that the pre-eruption interior of Santorini island was not filled with seawater as it is today. It doesn’t, however, have any direct connection to the events that led to the collapse of the major Late Cycladic culture on Crete, the Minoan, a few decades later. Disruption caused by the loss of a major trading hub and short-term damage caused by fallout of ash across the islands of the eastern Aegean might well have contributed to the eventual decline and fall of Minoan culture; but the later destruction of the Cretan palaces must have another cause. Earthquake, anyone? Novikova T et al., 2011, Modelling of tsunami generated by the giant Late Bronze Age eruption of Thera, South Aegean Sea, Greece. 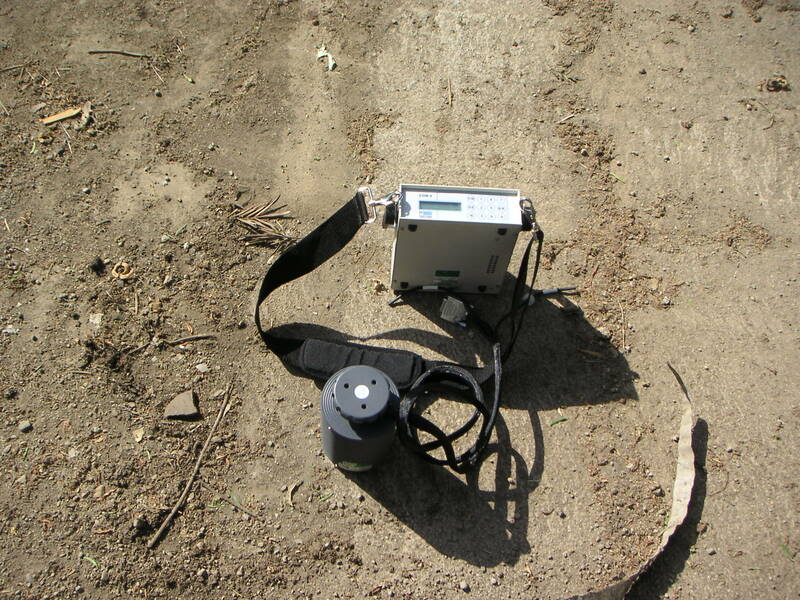 Geophys J Int 186, 665-680. Thanks to NERC for funding for my work on Santorini; the organisers of NEMO 2016 and Heliotopos Conferences for a recent visit to Santorini; to Christos Doumas, Lefteris Zorzos, Clairy Palyvou and Maya Efstathiou for introductions to Akrotiri and the Late Bronze Age, and Floyd McCoy for discussions. Oshima Ko Jima on May 4, 1805. Sketch by Wilhelm Tilesius. One of the delights of talking to children of primary school age is their disarming ability to ask really simple questions that demand straightforward answers, but leave you struggling to throw your academic caution to the wind. Even with the questions of the biggest, the smallest, the oldest and the youngest there are still different ways of (over)interpreting the question, that can leave you floundering. 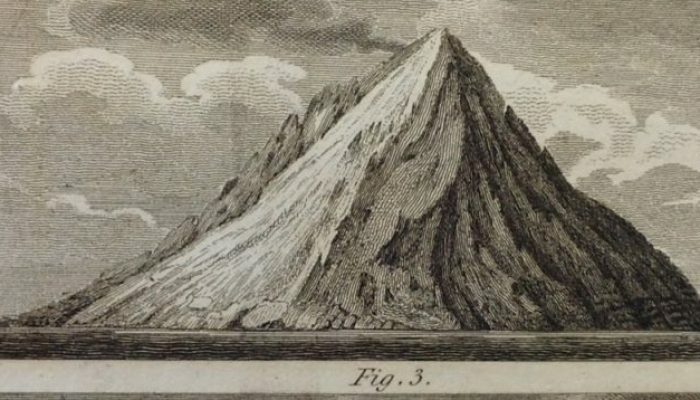 So for those of you looking for a clear answer to ‘what is the smallest volcanic island in the world?’, here is a suggestion of an answer from the early 19th Century. In 1805, Wilhelm Gottlieb Tilesius was engaged as the physician, naturalist and draftsman on the Russian ship Nadezhda, on the first Russian circumnavigation of the world. In May 1805, they were sailing across the sea of Japan and past the Matsumae peninsula in northern Hokkaido, heading for Kamchatka, when they came across two small volcanic islands ‘Oosima and Coosima’. Tilesius described Coosima (Oshima Ko Jima) as ‘perhaps the most diminutive volcanic island in the world’, noting that it was essentially a small pointed rock, which was incessantly smoking. The island was just ‘150 fathoms’, or 270 m, tall; lacking in vegetation and made of dark blue lavas with a weatherbeaten dark-red skirt around the base. Tilesius made all of his observations from on-board ship, as it took a quick tour around the island, and describes ‘light coloured smoke’ and ‘blue sulphur flame’ from the summit crater. 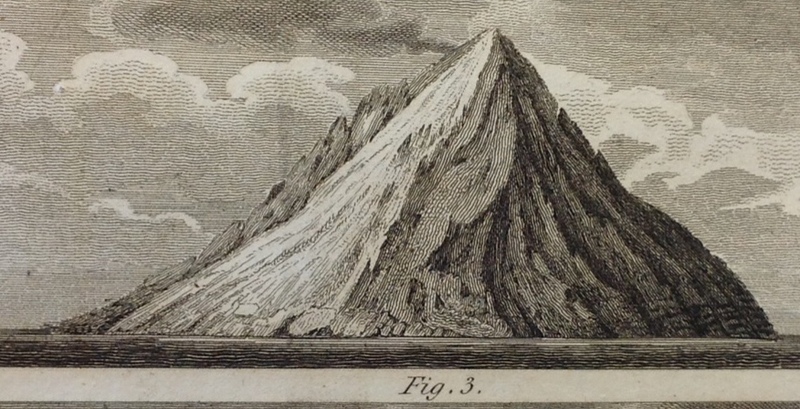 Tilesius’ paper suggesting that this was the world’s smallest volcanic island soon found it’s way into Charles Daubeny‘s ‘Active and Extinct Volcanoes‘, and shortly afterwards in a number of popular periodicals of the time. Whether – with an area of 1.5 square kilometers – it really is the world’s smallest volcanic island; and whether it is actually ‘active’ are both moot points; in fact, so little seems to be known about the island that the Smithsonian catalogue still lacks a photograph of it. Dr W Tilesius, 1820, On the Volcano called by the Japanese Coosima and situated in the neighbourhood of Cape Sangar, in the archipelago of Japan, Edinburgh Philosophical Journal, Vol III, no 6, October 1820, pp. 349-358. Living with volcanoes, and learning from the past. Nevado del Ruiz. Colombia. Photo by Anna Hicks, from the Volcanoes Top Trumps website. November 13th, 1985, is a date that is still etched in my memory. This was the day that the Colombian town of Armero was submerged beneath a catastrophic flood of volcanic rocks, mud and water; a lahar that had swept down from the summit of the volcano Nevado del Ruiz, erupting about 40 kilometres away. For days, terrible scenes of anguish and despair filled our television screens, as rescuers struggled desperately to help the survivors, and recover the many thousands of victims. 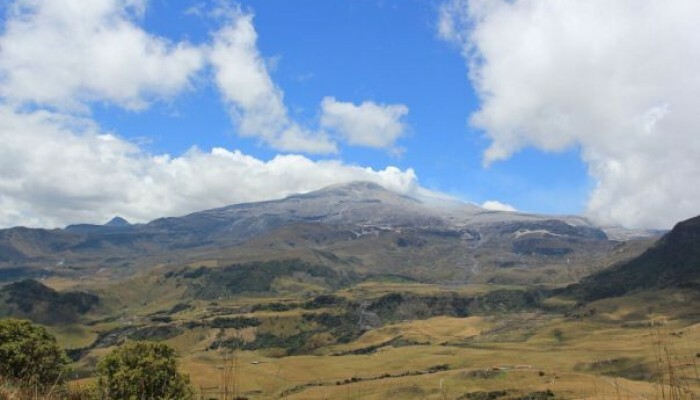 Thirty years on, and Colombia has one of the most sophisticated national volcano monitoring systems in the world, run from a network of observatories by the Servicio Geologico Colombiano (SGC). But what of the people of Armero; the survivors, and those who still live at the foot of the restless volcano, Nevado del Ruiz? Over the past year, researchers from the University of East Anglia and the ‘STREVA‘ project have been working with the SGC and a filmmaker, Lambda films, to collect oral histories, to explore what people recall from that fateful day, and to learn more about how people live with the volcano today. The result is three short films: beautifully shot, tremendously moving, and well worth a few minutes of your time. The first volcanic eruption to be photographed? Vesuvius in eruption, April 26, 1872. In the digital era of instant communication, breaking news of volcanic eruptions usually arrive image-first. This year, spectacular eruptions of Calbuco (Chile), Fuego (Guatemala) and Etna (Italy) have all made it into the end-of-year ‘top tens‘, in glorious multicolour detail. But when was the first photograph taken that captured one instant during a volcanic eruption? And which was the first such photograph to make it into print? One example may be the April 1872 eruption of Vesuvius, Italy. This short and destructive eruption was one of the most violent paroxysms at Vesuvius during the 19th century. 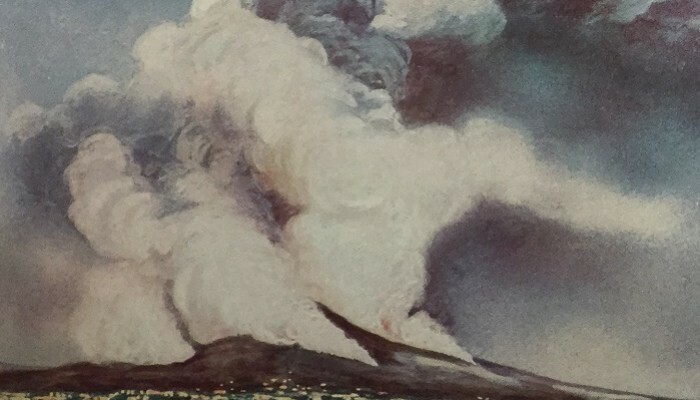 The eruption was quickly documented by Luigi Palmieri – Director of the Vesuvius Observatory from 1852 – 1896. His report of the eruption contains a dramatic line drawing of Vesuvius in eruption on 26th April, which the caption implied was a sketch based on a photograph taken from Naples. Vesuvius in eruption, April 26, 1872. Original caption ‘from a photograph taken in the neighbourhood of Naples”. (Palmieri and Mallet, 1873). Some years later, John Wesley Judd (1881) noted that ‘on the occasion of this outburst [the 1872 eruption], the aid of instantaneous photography was first made available for obtaining a permanent record of the appearances displayed at volcanic eruptions‘. 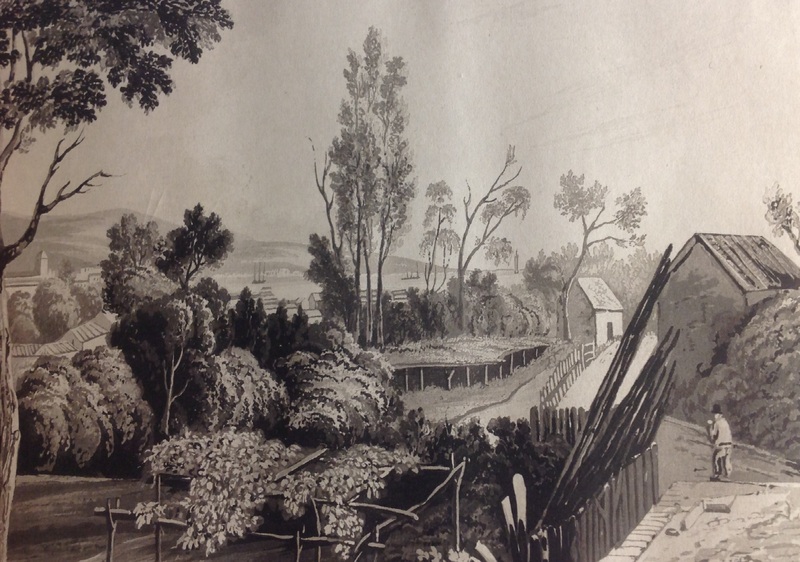 Judd published a woodcut of a photograph as Figure 5, with no further details relating to its origin; but the image is clearly of the same event and from a fairly similar location to that depicted by Palmieri. Vesuvius, April 1872. Woodcut image, originally published as Fig. 5 in Judd (1881). 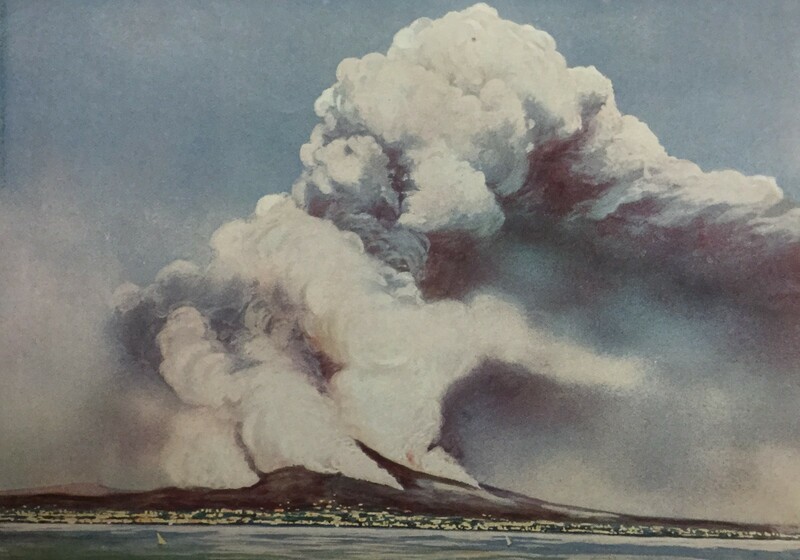 A very similar image – most likely a photograph from the same sequence seems to have later become a ‘stock’ volcano photograph; appearing as the frontispiece to Edward Hull‘s ‘Volcanoes past and present’ (1892), as Plate 1 in Bonney‘s ‘Volcanoes’ (1899), and even later as a repainted, colour plate in a popular science magazine (Thomson, 1921). Eruption of Vesuvius, 1872-3. Frontispiece in Hull (1892). Original caption ‘From a photograph by Negrettti and Zambra’. 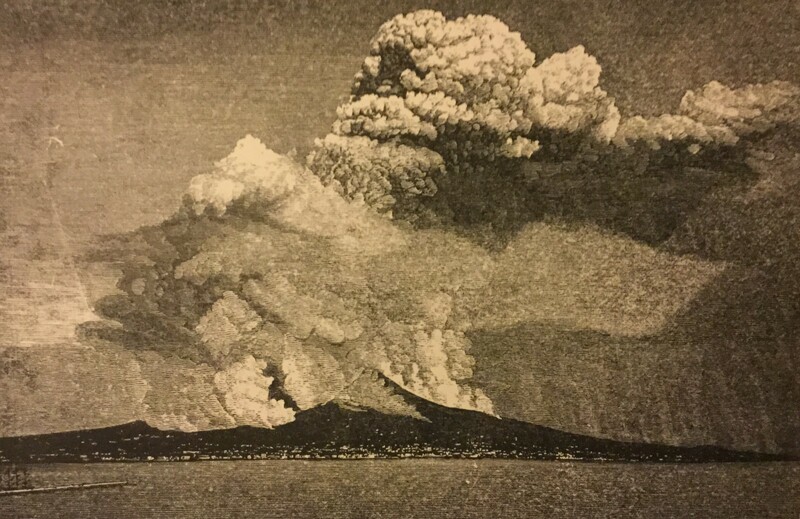 Vesuvius 1872 from ‘The outline of science’, Thomson (1921). Original caption ‘from a photograph by Negretti and Zambra’. Both Hull and Thomson credited the photograph to ‘Negretti and Zambra‘, a company specialising in optical, photographic and meteorological instruments, and photographic materials – including lantern slides. A plausible candidate for the original photographer could be Giorgio Sommer, who ran a studio in Naples. Some of his collections of photographs of Vesuvius from this eruption can be found in archives including Luminous Lint and elsewhere. 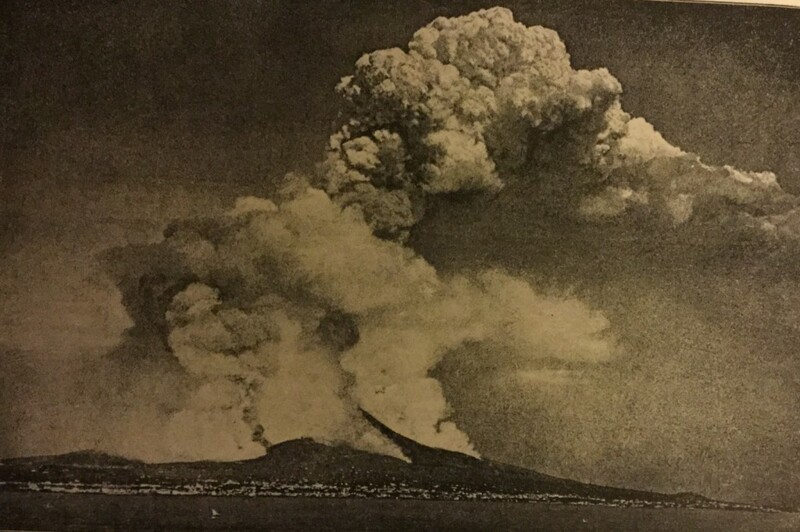 As an indication of the wider circulation of these images at the time, another similar image can be found as a glass plate in the archives of Tempest Anderson; a British opthalmologist and inveterate traveller and photographer of volcanoes in the late 19th Century. Anderson’s scientific volcano photography included documenting the aftermath of the devastating eruptions of the Soufriere, St Vincent, in 1902, some images of which were published in his 1903 illustrated book ‘Volcanic Studies’. But are these action shots the first ‘instantaneous’ images of an explosive eruption? A quick search reveals a few albumen prints of steaming volcanoes from the latter parts of the 1860’s (including Etna in 1865, by Sommer; Nea Kameni, Santorini, Greece in 1866; and an image of Kilauea that perhaps dates from 1865). There are also other images of the April 1872 eruption, although taken from a rather different and less revealing location. So perhaps Judd was right – or do any readers have any other suggestions? Cited references and further reading. Anderson, T (1903) Volcanic Studies. John Murray, London. Bonney, TG (1899) Volcanoes: their structure and significance. John Murray, London. Hull, E (1892) Volcanoes: past and present. Walter Scott, London. Judd, JW (1881) Volcanoes: what they are and what they teach. Kegan Paul, London. Palmieri, L (1873) The eruption of Vesuvius in 1872. With notes, and an introductory sketch .. by R. Mallet. Asher and Co., London. Thomson, JA (1921) The outline of science, George Newnes Ltd., London. The eruptive history of Vesuvius is documented in Scandone et al., 2008, and listed in the Smithsonian Institution Global Volcanism Programme pages. I am a volcanologist based in Oxford, UK, with an interest in the stories of past eruptions. My blogs tend to focus on volcanoes – contemporary, recent or ancient. There will be quite a lot of ‘historical volcanology’ in my posts over the next few months, as I am curating an exhibition on volcanoes with Oxford’s Bodleian Libraries, which will open in Spring 2017. I am delighted to have joined EGU blogs, and hope that my posts may find some interested readers! The great Rift Valley of Ethiopia is not only the cradle of humankind, but also the place on Earth where humans have lived with volcanoes, and exploited their resources, for the longest period of time. Perhaps as long ago as 3 Million years, early hominids began to fashion tools from the volcanic rocks from which the Rift Valley was floored, including basalt and obsidian. View into the Main Ethiopian Rift Valley, on the descent from Butajira to Ziway. Aluto volcano in the centre distance. The Ethiopian Rift Valley is just one part of the East African Rift system – the largest active continental rift on Earth. While the Ethiopian rift hosts nearly 60 volcanoes that are thought to have erupted in the past 10,000 years, there is only very sparse information about the current status of any of its ‘active’ volcanoes. There are historical records for just two or three eruptions along the MER: 1631 (Dama Ali), and ca. 1820 (Fantale) and (Kone). In contrast, the Afar segment of the rift includes one volcano known to have been in eruption almost continuously since 1873 (Erta Ale), and several other volcanoes that have had major recent or historical eruptions (Dubbi 1400 and 1861; Dabbahu, 2005; the Manda Hararo Rift, 2007, 2009; Dallafilla, 2008, and Nabro, 2011). So are the volcanoes of the MER simply declining into old age and senescence? Or do they continue to pose a threat to the tens of millions of people who live and work the land across this vast region? Panorama of Lake Shala, part of which fills the huge caldera of O’a volcano. To address this question, and others, the NERC funded RiftVolc consortium is carrying out a broad-scale investigation of the past eruptive histories, present status and potential for future activity of the volcanoes of the Central Main Ethiopian Rift. This spans eleven known or suspected centres, several of which have suffered major convulsions of caldera-collapse and eruption of great sheets of ignimbrite across the rift floor in the distant past. The first challenge is to piece together the eruptive histories of these volcanoes over the past few tens of thousands of years, and this is something that starts with fieldwork designed to detect the traces of these past events in the rock record. The RiftVolc field team, led by post-doctoral researcher Karen Fontijn, and with doctoral students Keri McNamara (Bristol) and Ben Clarke (Edinburgh) and masters students Amde and Firawalin (AAU) are spending the next five weeks completing a rapid survey of the volcanic ash and pumice deposits preserved within the rift. Panorama of the eastern caldera of Corbetti volcano. The first challenge is to identify the tell-tale clues that the sequences of young rocks, soils and sediments contain volcanic deposits. Close to the volcano, we might expect an individual large explosive eruption to leave both thick and coarse deposits; but go too close to the volcano, and there may be so much volcanic material that it can become hard to identify the products of single significant eruptions, as opposed to the ‘background noise’ of smaller but more frequent eruptions. Out on the flanks of the volcano and beyond, we have the vagaries of geological preservation (did the pumice or ash land somewhere where it would then stay unmodified?) and erosion and weathering (removing or modifying the evidence) to contend with. Each of these factors will depend not only on the nature of the original deposit (how thick it was; what it was made from); but also on the environment in which the deposit formed (on a lake bed? the open savannah? a forest? On a slope, or not? ), and on the subsequent history of that environment (did the lake dry out, or continue to fill with sediment? Did the pumice become stabilised in the grass land; or did it get blown or washed away? How quickly did the soil and vegetation recover after the eruption? How deeply has weathering penetrated in the intervening millennia since the eruption?). Lots of questions to ponder! Our long-term goal is to better understand what sort of hazards the Rift’s volcanoes pose to those who live on and around them. There are, of course, much greater immediate challenges to communities in the region linked to the competition for the natural resources (water, land) in this region; but the rapid development of geothermal prospects in the Rift does mean that we need to pay closer attention to the state of the volcanoes that are the source of the geothermal heat. Aside from the volcanoes, the main Ethiopian Rift and its lakes make for a spectacular environment to work in. Despite receding lake levels and failing rains this year, there are vibrant patches of forest and a host of exotic birds and animals to enjoy. Acknowledgements. RiftVolc is a NERC-funded collaborative research project. Many thanks to our Ethiopian collaborators at the Addis Ababa University School of Earth Sciences and the Institute of Geophysics, Space Science and Astronomy (IGSSA) for hosting us and facilitating the joint field campaign; and to Ethioder for providing field vehicles and excellent drivers. As a volcanologist based in the UK, I am in the privileged position of rarely being affected by the natural events that I study. And, although I have worked for extended periods of time in earthquake-prone regions, I have never experienced anything more than the gentle nudge of a small tremor. Thirty years ago, shortly after 7 am local time on 19 September 1985, Mexico City was struck by a large earthquake. 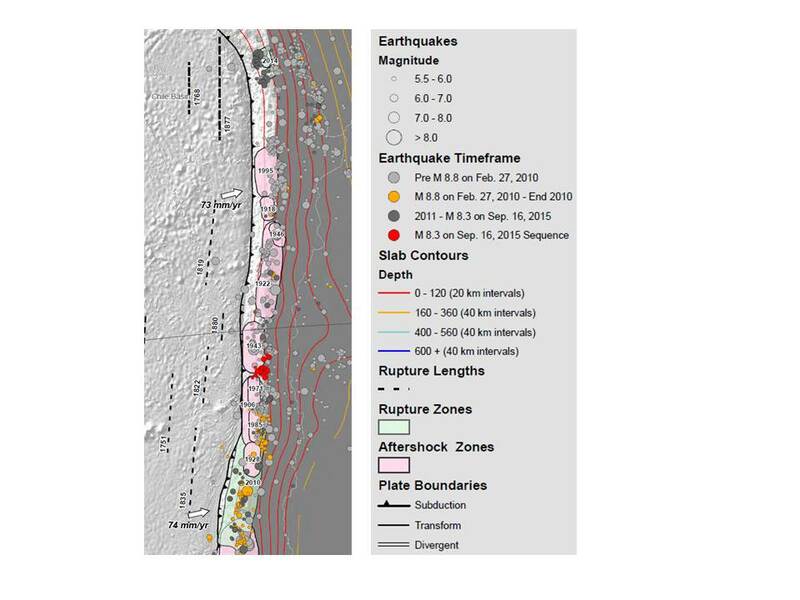 The epicentre was near the Pacific coast, and the main event had a magnitude of 8 – just a little less than the September 2015 Illapel earthquake in Chile. Listening in the UK to BBC reports, it soon became clear that there was a terrible disaster unfolding – even though the conurbation was hundreds of kilometres from the epicentre, there was considerable damage to hundreds of buildings across the city. Later analysis revealed an unusual feature of the damage – most of the buildings that collapsed were 5 – 20 stories high; while the majority of both shorter, and taller, buildings were undamaged. This feature arose from the local geology – much of the city is built across old lake deposits. The layer of lake sediments acted to amplify the ground motion as the seismic waves passed by, leading to strong accelerations, and a characteristic period of around 2 seconds. Buildings with a natural period of vibration close to 2 seconds would have begun to resonate, and eventually fail catastrophically, as the strong shaking continued for several minutes. The result of this was a shocking pattern across the city of collapsed buildings cheek by jowl with others that showed no signs of damage. Among the many thousands who lost their lives were several British language students, who had just arrived in Mexico City on their way to their ‘year abroad’ teaching assignments across Latin America. One, Helen Cawthray, was a linguist at St Catharine’s College, Cambridge; a contemporary and friend of mine. 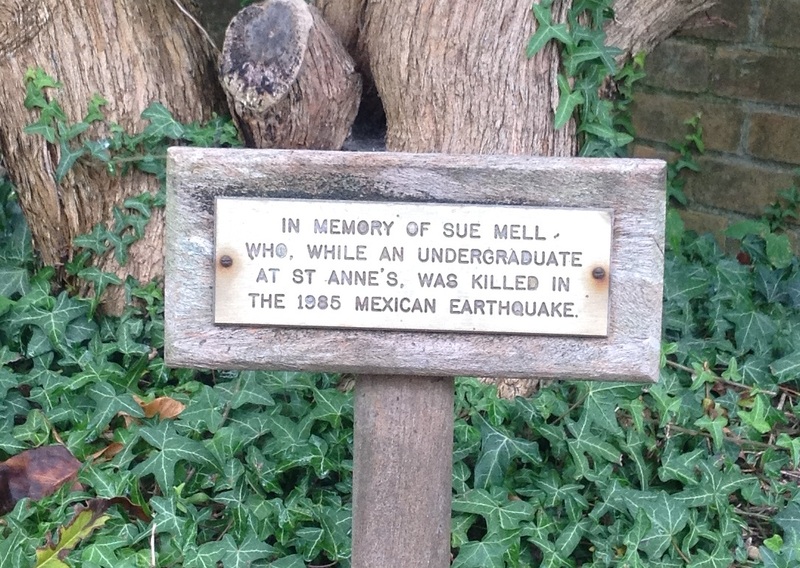 Another, Susan Mell, was a linguist at St Anne’s College, Oxford, where I now teach Earth Sciences. A poignant reminder not only of the random element of disasters, but also of their global reach. As we look back on the thirty years that have passed, the question remains: have the lessons been learned? Or might it all happen again? As news comes in of another very large earthquake in Chile – the third magnitude 8 earthquake along Chile’s Pacific margin in the past six years – this is a stark reminder of the destructive potential of these extreme natural events. These days we are used to the rapid, or near-real-time diffusion of news as these events unfold – in this case, as the tsunami ran along the Chilean coast, and propagated across the Pacific ocean. First indications are that the region that ruptured during the earthquake was a large section of the subduction zone plate boundary where the Nazca tectonic plate is sliding beneath the South American plate; close to an area that previously ruptured in great earthquakes in 1943, 1906, 1880 and 1822. Map of historical rupture zones of large Chilean earthquakes. The red dots show the locations of the 16 September 2015 earthquake and early aftershocks. Source: United States Geological Survey. One of the earliest first-hand accounts in English of a large earthquake in this part of Chile comes from the writings of Maria Graham, who was living near Valparaiso in 1822; close to the source of the great earthquake of 19th November 1822, and within the region that was most hard hit by the event. Her journal – published in 1824 – records the event in great detail; and in particular, describes the dramatic coastal uplift that occurred as an immediate consequence of the event. A version of her report was later read to the Geological Society of London, where it caused a good deal of interest and, later, controversy. ‘At a quarter past ten [in the evening], the house received a violent shock, with a noise like the explosion of a mine. I sat still.. until, the vibration still increasing, the chimneys fell, and I saw the walls of the house open.. We jumped down to the ground, and were scarcely there when the motion of the earth changed from a quick vibration to a rolling like that of a ship at sea. The shock lasted three minutes. Never shall I forget the horrible sensation of that night. [Back in the house] I observed that the furniture in the different rooms .. Had all been moved in the same direction, and found that direction to be north-west and south-east. 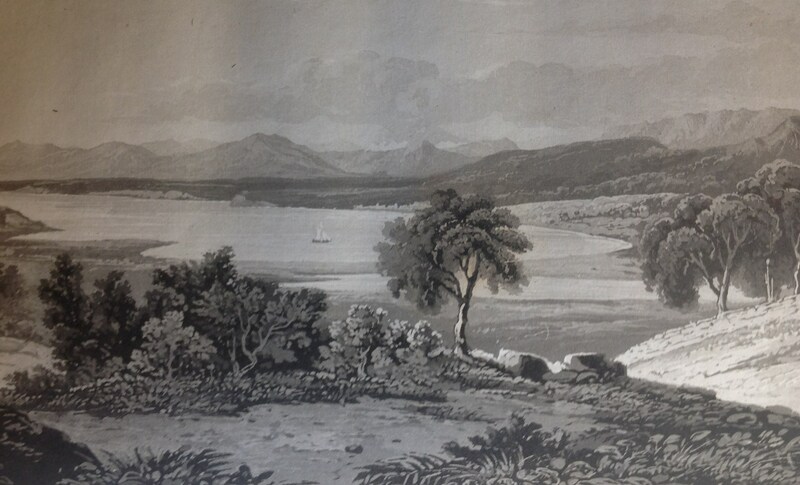 Mr Cruikshank has ridden over from old Quintero: he tells us that there are large rents along the sea shore; and during the night the sea seems to have receded in an extraordinary manner, and especially in Quintero Bay. I see from the hill, rocks above the water that never were exposed before. View of Quintero Bay, drawn by Maria Graham. Bodleian libraries, Oxford, 4° R 56 Jur. In her journal accounts, Graham went on to speculate that repeated earthquakes could be responsible for the general elevation of land, and the building of mountains, in places like the Andes; themes that were later taken up by Charles Lyell, and then Charles Darwin – who was in Chile 13 years later, where he experienced the 1835 Concepcion earthquake firsthand. Ethiopia is one of the most impoverished nations in the world, in terms of the number of people who live without access to electricity. 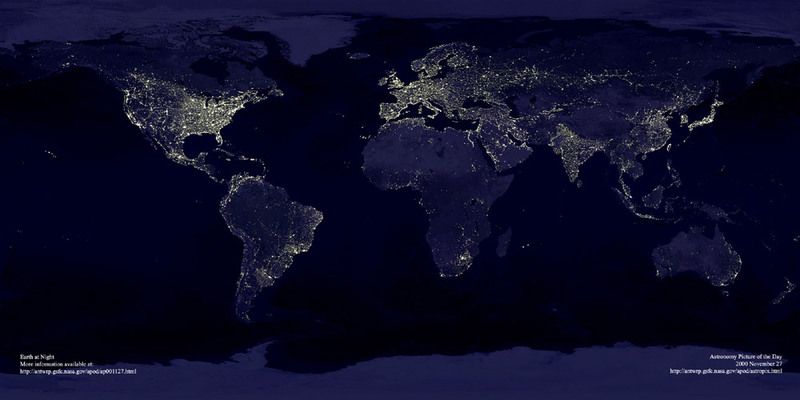 The World Energy Outlook reported that in 2014, 70 million people in Ethiopia, or 77% of the population, have no access to electricity. Ethiopia is also one of the more volcanically-active regions of the world, with 65 volcanoes or volcanic fields that are thought to have erupted within the past 10,000 years – though few of these volcanoes have been studied in any detail; and fewer still are closely monitored. Geothermal power plant infrastructure at Aluto volcano, Ziway, Ethiopia. One benefit of this abundance of young volcanoes is that the geothermal energy potential of the region is significant – offering the potential of accessible and renewable low-carbon energy. Further south, along an extension of the Great Rift Valley, Kenya is already taking steps to exploit geothermal energy, with an installed capacity by December 2014 of 340 MW and an ambition to increase this by at least an order of magnitude within the next 15 years. 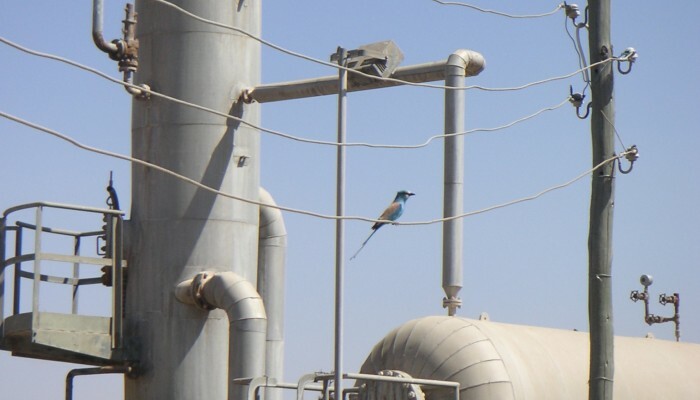 In Ethiopia, current capacity currently stands at around 7 MW – provided by the Aluto Langano Power Plant, which was the first operational geothermal power plant in the country. 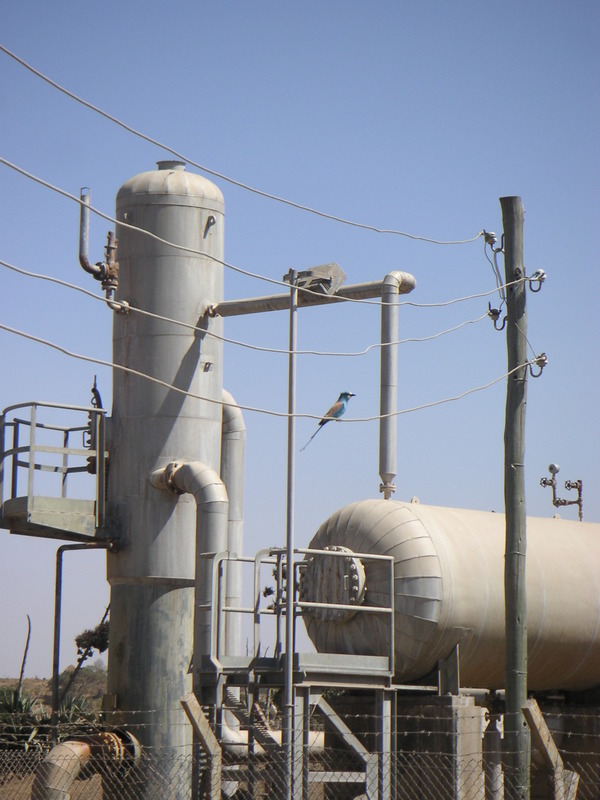 In Ethiopia, as in Kenya, there is considerable ambition to develop geothermal power further – with the several volcanic centres identified as having the potential to supply 450 – 675 MW by 2020. In a country where per-capita electric power consumption is just 52 kWh (100 times less than that in the UK), that’s a lot of new energy. 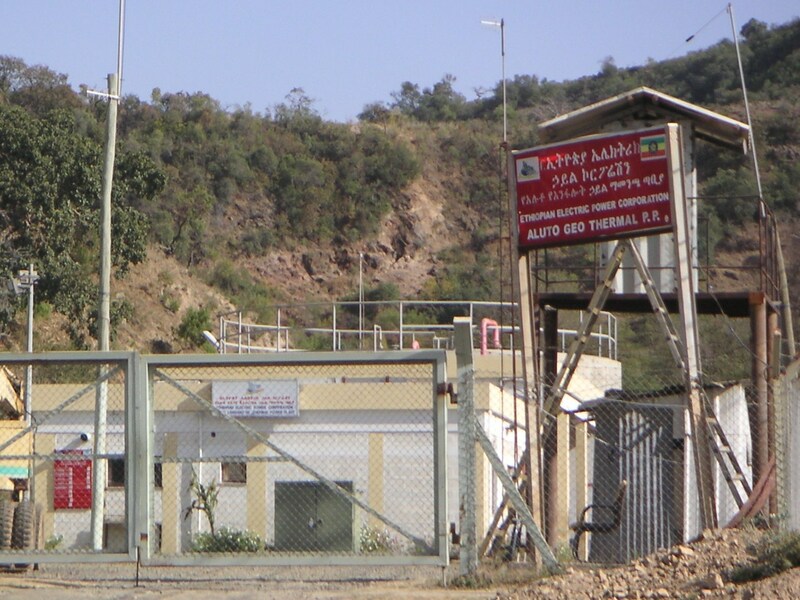 Entrance to the Ethiopian Electric Power Corporation Aluto Langano Geothermal power plant, in the centre of Aluto volcano, Main Ethiopian Rift Valley. All of this interest in young volcanoes as potential sources of ‘clean energy’ provides a significant opportunity for geoscientists to try and find out a little bit more about their eruptive past, and their potential for future activity; and to work out where the hot fluids and gases that provide the geothermal prospect are stored within the crust. Using a PP systems respiration chamber to measure the escape of CO2 from the ground surface across the volcano. At Aluto volcano, work by Will Hutchison using imagery from an aircraft survey (to identify young faults and fractures), and a ground-based survey of where (natural) carbon dioxide is seeping out of the volcano at the present day, has helped develop a cartoon ‘model’ for this volcano. Our current view is that Aluto volcano currently leaks quite small amounts of heat and gas to the surface; mainly along long-lived fractures and faults, some of which have origins older than the volcano itself. Inside the volcano, fluids are trapped under layers of impermeable rock – perhaps two to three kilometres below the surface – where they are heated by the warm rocks of the volcanic hearth. Planned drilling campaigns on Aluto, and on the neighbouring volcano and geothermal prospect, Corbetti, should eventually fill in some of the gaps in our geological knowledge; and help to transform the energy futures of some of the millions of people who live along the Ethiopian Rift valley. Kebede, S., 2012, Geothermal Exploration and Development in Ethiopia: Status and Future Plan, in: Short Course VII on Exploration for Geothermal Resources, 14 pp.